It was just over two years ago when I was summoned to the Netherlands by Jan Ewoud Vos, the very creative director of Puredistance. I scent for personal pleasure and on occasion to create atmosphere. But there is another reason that I like to be fragrant. I use scent as a disguise because my personal aroma attracts men, women, dogs, cats and opossums if it is not veiled with blends of frankincense, wormwood and patchouli. In Asia I have to be wary of snakes. Meneer Vos had heard of my scent aura via The Fragrant Stratosphere and he invited me to a meeting with him and perfumer Antonie Lie. I found the Puredistance HQ tucked behind a canal but it was not so much a meeting in Groningen; before I knew it I had been strapped to a human sized head-space technology machine thingamajig. The machine thingamajig breathed in from my pores. Recalibration was needed as the analysis was showing I was sweating sinking grade oud oil. Which explains why a certain oud seller visits me annually to collect my sweat to add to his plantation sourced oud oils. A lengthy meeting ensured and my IP lawyer flew in from Australia to complete a satisfactory agreement including confidentially. 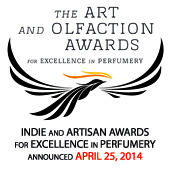 Imagine my surprise when Normand Cardella in Canada starting writing about my scent aura. Suddenly Lucas, The Chemist in the Bottle, was analyzing the very essence of my being. 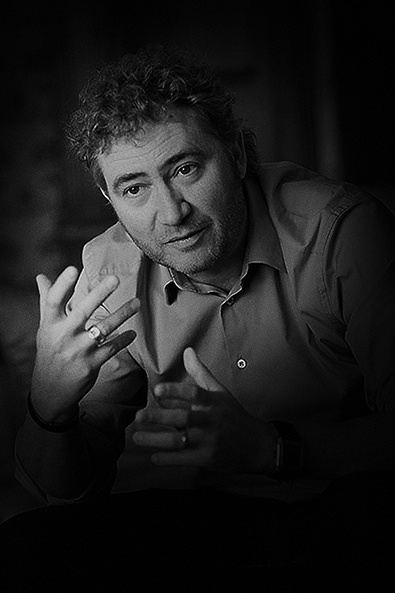 Perfume Theorist Juraj Sotošek Rihtarec had waterfalls of words in French, English and Croatian to assess my scent. Vanessa was telling me she absolutely loves me in a majuscule kind of way. Perfume Analyst Kafka almost saw a cherub while he was landing on a fluffy cloud whilst inhaling. Mark Behnke was bespelled. Elena said I filled a void the she hadn’t realized was there as she placed me on her perfume shrine. Natalie thought me to be excellent company. The Scented Hound was calling me a man of many secrets. Caro said I was casting a veil of mystery while Gaia was caught up in an emotional storm. Birds were twittering and Katja de Bruijn was tweeting #pdblack . Robin at Now Smell This was even telling people that I would be available. If these wrists could whisper they would be calling out my name. Dear Reader, please excuse any impression of vanity or vain-glory. My reaction to this scent was so personal that I felt like the above fantastical events had taken place. All I could do was envision, smell, and feel this scent swirling into my life story. I am in agreement with the above statement; the whispering had my nose planted on my wrist to inhale this pianissimo suede with unreleased notes. Of course the notes are only unreleased until they warm up on your skin. Then you may be able to analyze the various notes or just enjoy the blend. If you have to know the notes then the highly esteemed noses of The Non-Blonde, Kafka, CaFleureBon, The Chemist in the Bottle, The Perfumed Chronicles and The Scented Hound will give your nose some pointers. As will Bonkers About Perfume, the cleverly named BLeauG and my other colleagues listed in detail below. Or you could run the ‘fume through your home gas-chromatographer for a GCA print out. For me, as with any ‘fume it is always more about the blend, the composition, rather than individual notes as notes behave differently when made into accords. The BLACK accords smell of highly polished leather turning into suede then into a chamois generously splashed with Laotian Oud, a dab of cresol and sprinkled with crumpled patchouli leaves. If I was to use only one word it would be beautiful. This is an aura scent that shines at an ambient level. It also smells expensive. Puredistance BLACK is a Black Beauty. This is one of the 7 wonders of the modern perfume world. You can find out more about the other wonders in an upcoming post. Commenting on Now Smell This. a luxurious mystery, a soft start to a pervasive and layered scent experience that is a modern or even futuristic version of what darkness is, like swimming or flying through dark water or a night sky in a vehicle engineered by the most artful scientist. It begins with a pure point of faraway darkness, warmed by amber, disclosing after a time within its enfolded layers heated florals that increase and increase in strength as time goes on. Clarimonde finds this perfume tenaciously holding on to her luminous skin and transferring itself to the skin of those she embraces. It fits with the image of an athletic man wearing a black sweater that flatters his figure. And makes you look repeatedly. Perfumes of this kind, from Amouage to By Kilian often use their sillage to assert themselves as luxury. Not here, though, and as the press materials stress– this is a feature, not a bug. As Black’s heart progresses, you are taken on a journey over blackened, pebble smooth roads filled with complex twists and turns, traveling through a forest of smoke and sensual woods. Puredistance BLACK isn’t the absence of light; it is the play of illumination and shadow ever shifting on my wrist. 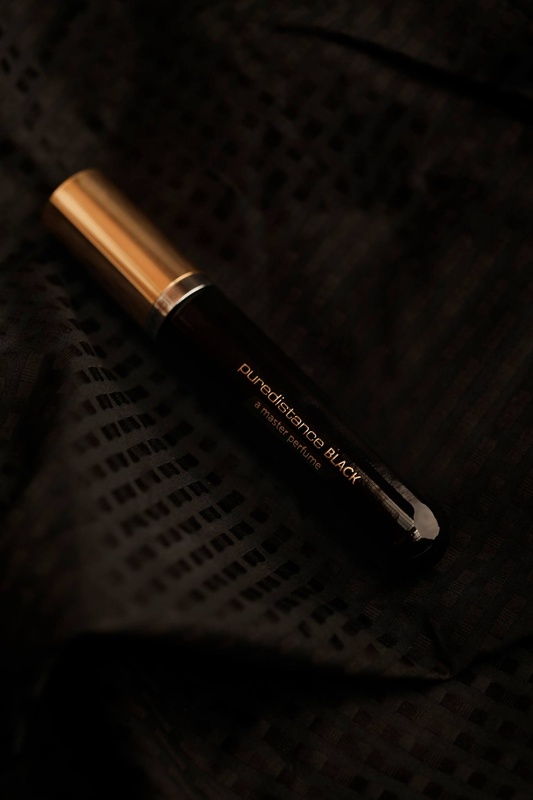 Soft and textural, it feels like perfumed velvet, wrapped around a crystal well of jet black ink. Now I have to get back to my whispering wrist. What is it saying…? Frank? Ah, frankincense, wormwood and oud. I think there may also be potent # effects as evidenced by some of the reviews listed below. BLACK will be available December 01 on the Puredistance website. Retail supply is scheduled to be completed by mid December 2013. Released when they warm up on your skin. You sound like a Sufi Girl, ah, you are . Thank you for whirling in like a dervish. Here’s to the mystery of peace, love and perfume. 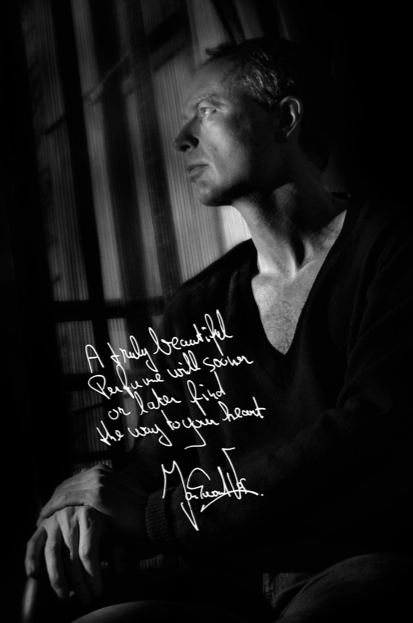 Jordan – I love this post! Mr Hound, I love your nose! 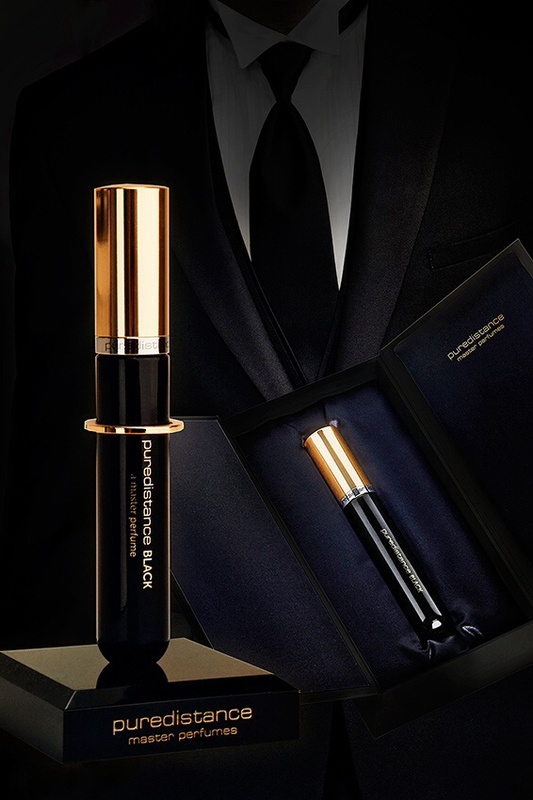 Isn’t BLACK a lovely perfume? I’m glad you find it appealing like I did. It’s a beauty and a wonder. You are too! Undina, a day without a laugh is like a day without perfume; wasted. As for your attitude young lady I say “don’t analyze”. As for BLACK it’s me not you: lol. I read your comment and I laughed too. Great! Then we both didn’t waste this day (I also wore OJ’s Tolu). While enjoyable, not completely worthy of the Puredistance name. Welcome Flaconneur. Great name by the way. Always happy to have two or several opinions on the table. Thankyou for zoomin’ in with your comment. On Per Fumus I admire your nose and your prose. Why thank you, Jordan. 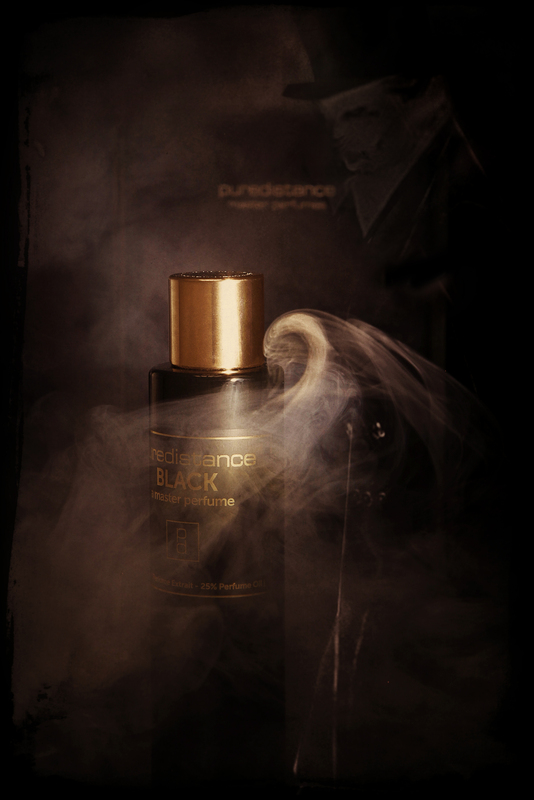 Puredistance has done a wonderful job of creating a perfume collection that is extremely memorable. For me, Black might get lost in their collection thus far. Good point. It’s subtly will be perhaps be under-appreciated. I like this much better than M but others would waft M sooner than this I expect. I much more prefer “M” over Black. Then again, Roja Dove is a much different perfumer than Antonie Lie. Jordan, thank you for the review link! I love your article. I think Black is a very chic leather perfume. Actually probably my favorite of Puredistance at the moment (that changes with mood however). очень приветствуются, so welcome. Yes chic, chic alors. We have so many amazing choices these days. I am very in the mood for BLACK. I loved your MO in this review and am happy that you were also smitten! I feel a very visceral attraction to BLACK, even if the relentless capitalisation does trouble me now and again. It is my favourite of the line so far, hands down. 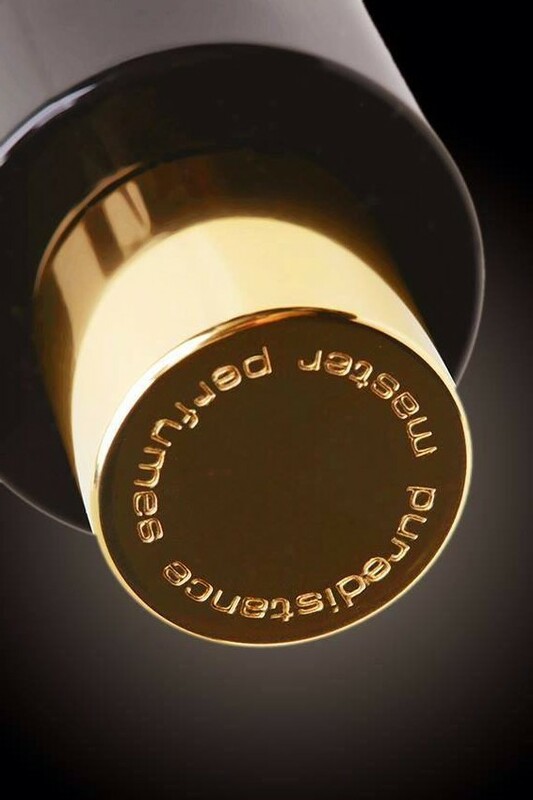 Relentless, ridiculous and redundant capitalization – the perfume whispers, the name SHOUTS and the brand is lowercasewithnointerwordseparation. But onto the ‘fume, yes, we are breathing the same air. Thank you for wafting by Vanessa. I see that you too paid a visit to the Puredistance HQ. I see you made a comprehensive post on thoughts of Black (it definitely deserves to be talked about so much). Solves all wardrobe thinking including SOTN. More time to read Ines.